Before Rez was Rez, it was K-Project. Then it was Project Eden. Then it became Vibes. 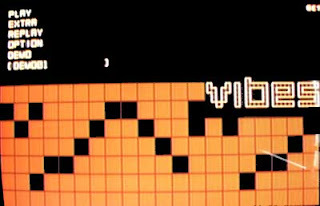 In March of 2008, Vibes leaked online. Dated 2001/06/01 (Build 036), it's really close to the final version of the game, with a few major differences. Of course, the most notable is the music. Adam Freeland's "Fear" from Area 5 is in the game with a slightly different arrangement, but the rest of the tunes are provided by Underworld. Pacing, enemy locations, and some backgrounds are different than the final. As expected, there is a little slowdown and a few bugs, but the game is completely playable. Although Areas 1 through 4 remain largely the same, Area 5 has seen the most changes before release. A different flavor of "Fear" is used, one that has repeating voice loops throughout. None of the text describing evolution is included in this level, instead just shuffling players from one spot to the next. 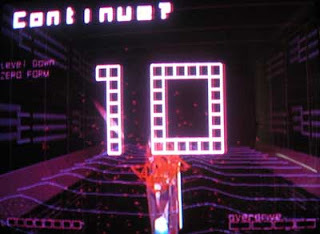 After finishing Area 5, an "Area 5 logout" screen appears and transports players to Area 6 instead of going straight into the second round of bosses. No longer do the "Why are you here?" messages appear. Rather, explosions eventually reveal the names and forms of the upcoming bosses. Throughout this last Area, there is no music. Upon reaching Eden, the camera is located right up next to her instead of at a distance, making things quite trickier, as enemies fire from the front and rear. The level looks pretty much the same layout-wise, but the enemies themselves have changed. There are a lot of missiles flying around, fired from machines traveling along the tracks surrounding Eden. A bit different from the final, this time they are destroyed easily, instead of taking repeated shots before finally going down. Eventually, large orange orbs will appear and after several shots, they release fragments of Eden, who is gradually pieced back together. 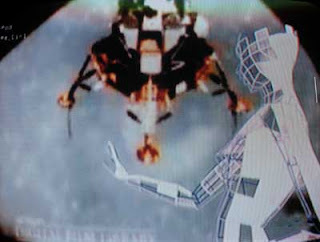 Movies still appear showing her reconstruction, but they're longer and have different scenes in the background - a cell dividing, landing on the moon, and lots of landscapes, such as deserts, waterfalls, forests, and the like - all of which is stamped "Digital Film" in the corner. All in all, Vibes is an interesting glimpse into the past of Rez. It can be found pretty easily, with only a little digging and plays on a standard Dreamcast. If you're at all interested in Rez, this is definitely worth checking out. Focused on games of the Sega's Saturn, Dreamcast, and arcade division of this era, as well as current offerings.